Processing tube ends with diameters from 3/4" – 2" including flattening, cutting and perforating the end. Manufacture of closed clamps for tubes with diameters from 1" to 3" including post-production zinc coating. Metals 3-4mm thick and 30-40mm wide. Manufacture of omega brackets for tubes with diameters from 1" to 3", including zinc coating after manufacture. Metals 3-4mm thick and 30-40mm wide. Processing tube ends with diameters from 3/4" – 4" including bending the end and perforation (tube thicknesses up to 4mm). Gildan supplies 60-300mm joists including round and oval perforations of various diameters. Manufacture of clamps for profiles of width 60-120mm including post-production zinc coating. Metals 3-4mm thick and 30-40mm wide. The factory has machinery for perforating metal with thickness of 1-8 mm. Manufacture of clamps for tubes with diameters from 1" to 3" including post-production zinc coating. 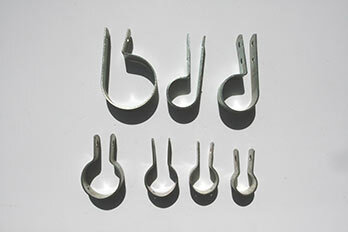 Manufacture of clamps for net-houses with diameters from 1" to 3" . 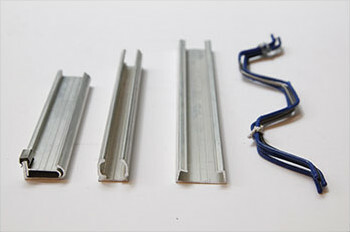 Gildan manufactures gutter brackets and ends, including end drainage, 4" diameter.